Healthy lifestyle and sport concepts. 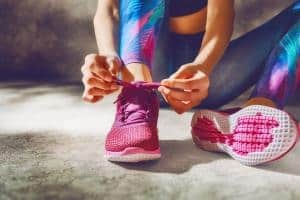 Most of the time, athletic shoes can be categorized two ways: neutral sneakers and stability sneakers. Stability sneakers most often contain a midsole and heel that is cushioned, helping to control foot motion and prevent overpronation, which is a tendency to roll the foot inward too much, disrupting weight distribution and affecting shock absorption. While the studies show that stability shoes can increase stresses on the knee more so than a flat shoe, they can still be a good choice in some cases. “Stability shoes take weight off the ball of the foot, which is important for people with hip, knee, foot or ankle OA, RA, toe arthritis, or pain in the footpad,” says Dr. Teimouri. Not sure if you have normal pronation or not? Dr. T has advised asking the staff member of a store that specializes in athletic footwear. “Bring in an old pair of running shoes. They can determine your pronation by looking for the distinctive wear patterns caused by abnormal pronation,” she says. Dr. Teimouri notes that a few stores even have digital foot scanners, a high-tech machine that can discover your exact biomechanical problems. Dr. Tina advises that athletic shoe styles vary year to year. New Balance, Asics, and Avia, along with others are able to offer stability and neutral shoes that come in a wide array of widths, sizes, and features. She also says to try on as many pairs at a shoe store as it takes to find the pair that feels best for whatever your needs are.